In October, AT&T announced that they would start throttling data usage amongst mobile Unlimited Data Plan users. While AT&T no longer offers an Unlimited Data plan to new customers, many of the original iPhone purchasers are still grandfathered into that plan. Those iPhone users have been able to retain these Unlimited plans, even though AT&T has since moved to a tiered data plan structure. When AT&T announced their plan to start throttling users, the company said that they would only be throttling the top 5% of users. Early reports of affected users had pointed to 10GB-12GB per month users as the initially affected. It seems that ceiling has decreased significantly over the past few months, at least for some regions. 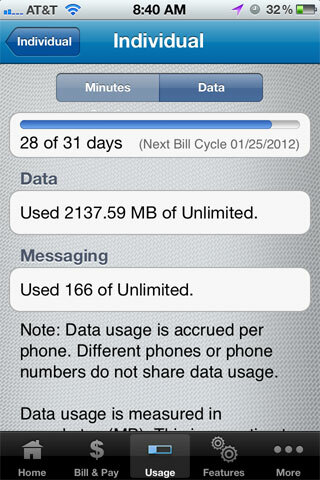 John Cozen reports that he received his top 5% data usage warning after reaching only 2.1GB of data for January. I received a message during my last billing cycle, warning I was in the top 5% of my region and would experience reduced data speeds next time I reach that level of data use. I immediately checked my data usage on the AT&T iOS app. 2.1 GB. Less than I expected considering AT&T offers a 3GB plan for $30 a month. The same amount I’ve paid for the unlimited data plan since signing up with them many years ago. AT&T no longer offers an unlimited data plan, anyone still on it has been grandfathered in. Cozen contacted AT&T to make sure it wasn't a mistake, and after several back and forth exchanges, it seems clear that it wasn't a mistake. The AT&T representatives seemed to confirm that 2.1GB did fall in the 5% range and the only option to avoid throttling was to move to a tiered plan. Cozen was understandably upset since AT&T even offers an unthrottled 3GB plan for the same price he is paying at $30 month. AT&T's top 5% measurement seems to be region-specific, as some users are continuing to see higher than 2GB usage without throttling. I got the same message right at 2gb. Ticks me off, really. 2gb doesn’t sound too unlimited. This is ********, how is 2gb unlimited. I also was throttled after 2 GB. It has been VERY frustrating to deal with because the throttling is INCREDIBLY slow. I am on the unlimited data plan. If my data is slow because of natural congestion then no one is limiting it, thus it is unlimited, and slow. However, if AT&T is limiting my data speed, then it is NOT unlimited. Moreover, their contract (AT&T) says that they have the right to throttle if you are abusing the network by doing things they do not permit (they have a list of things) and/or if you are compromising the integrity of the network. a) The speed you are throttled to is too slow to load webpages and other simple internet content. Often you have to reload. AT&T's full speed on an iPhone 4S in Sacramento is 3.5 Mbps. They have throttled me down to about 0.10 Mbps, about 2-3% of the normal speed. b) I do not abuse the network. I watch half an hour of video during my lunch break at work. That adds up to about 4 GB a month. c) I was throttled after using 2GB of data in 15 days. This is not compromising their network because they offer a 5GB plan. d) The point in which you are throttled is a floating, regional rule. If few people in your region do more than check their email, or if they are always in Wi-Fi, you are suddenly an "abusive" user. There will always be a top 5%. e) It does nothing for other users. I have streamed like this during lunch for a long time. It has always been fast. When testing the speed on friends' phones, they reach the speeds I have always gotten, even though a full 5% of AT&T's "data hogs" have been throttled down. f) Finally, network congestion doesn't happen by the GB. It happens during congested TIMES. A more sensible policy would be to limit users data who access it at highly congested times. The logical error there is: this already happens, that's what network congestion is, many people get on at the same time, and the network slows down. Think of rush-hour traffic. Just because 1 car drove across the country doesn't mean that they are the cause for slow traffic speeds at 6pm. This is totally out of character for AT&T! normally they don't seem like the type to slowly nickel and dime you until you're broke. My buddy stated getting throttled while only using 3 gigs a month on "unlimited". He was told by AT&T he was in the top 5 percent for "his area". We live in the SF Bay area so 3 gigs doesn't sound like very much. I do have to call BS on the 2GB throttle point when the 3GB plan costs the same amount of money as what he paid for his "Unlimited". Cap cap cap/throttle throttle throttle. I find it hilarious that whilst technology/internet innovation is rapidly evolving, the ISPs instead of following suit seem hell bent on putting on the handbrakes and stifling it. I wonder how long they think this strategy of theirs will hold out. and I didn't speak out because I had Unlimited data. I've averaged between 3-5 GB/month for several years on Unlimited data. Then on Thursday I get the email of death warning me that at 2.1 GB (nine days left in billing cycle), I was in the top 5% of heaviest users and would be throttled next month if I didn't change my sinful ways. So, all of you who received AT&T's extortion note, let them know you heard them loud and clear by filing a FCC Complaint. When you get your call from AT&T about your FCC complaint, be prepared to tell them that you think what they are doing is underhanded and dirty, and that the only way to resolve this is to give you the 5 GB + tethering plan for the same price of your now worthless Unlimited plan for the same $30/month for the life of your account.